Posts about stuff that deals with identities – Jewish, GLBT, and many others. 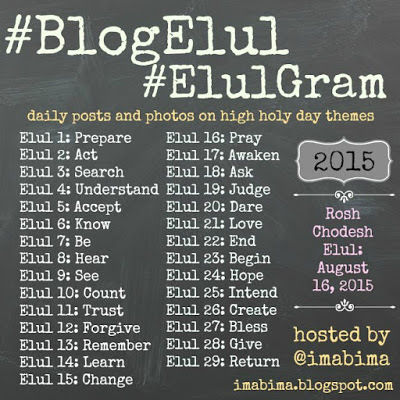 By the Hebrew calendar, it’s already the 8th of Elul. However, I didn’t post on Shabbat, so this is for the 7th. Yesterday was the 7th of Elul, which is 5 days before I become a full Member of the Tribe. Today’s theme is “be.” That’s also a toughie for me. Because today it’s raised the question: What does it mean to be a Jew? Being is a pretty encompassing term. It’s also not a word that exists in Hebrew in the present tense – it’s all implied. This can lead to some funny weirdnesses in translation. If I say “Ani Adam,” it literally translates as “Me/I Adam.” Which is clunky in English. But that’s not what I want to talk about tonight. Grammar is something for another day. Let’s talk about being. When we say I AM something, we mean in the present tense. In the past year, I’ve been saying I am a Jew, more and more, rather than “I will be a Jew.” Because I have felt like I am already a Jew, and this Thursday’s scheduled activities (beit din; mikveh) are just formalities. They will be profound formalities, but they will simply affirm what I already am. Although the term ‘sect’ is used in regard to Judaism, it’s essentially referring to level of religious observance and regional traditions not radically different beliefs. That, I think, is the best way to sum up the differences between my way of being a Jew and an Orthodox haredi’s way of being a Jew. And even then, I don’t think I’m at a lower level of observance than he is, but a different one. I’m still a Jew. I may not be his kind of Jew, but I’m still a Jew. Not for me – for the ultra-Orthodox. I chose Judaism because of several things: a sense of community, a sense of acts being more important than words or appearances, ritual that made sense to me and spoke to me. I chose Reform Judaism because Reform Jews are open-minded and welcoming while still maintaining the important traditions of Judaism – the ones that matter. Now. Given that, what I’m seeing from the ultra-Orthodox is that appearances are more important to them than actions, and that keeping up appearances is the most important thing. And in doing so, they are behaving in ways that are bigoted, small-minded, and even dishonest. When you hire Latinos to dress up as Orthodox Jews to protest my rights as a gay man, that’s dishonest. They’re not your Shabbos goyim. They are people playing a part to keep up appearances. When you try to block women from praying with the Torah at the Kotel and compare them to church arsonists, that’s small-minded and sexist. That’s not a mitzvah. It’s a sin. When you beat up a man who is brave enough to give them the Torah anyway, that’s not a mitzvah either. It’s a crime. When you cancel bar mitzvah services organized by the Masorti stream of Judaism for disabled kids because they don’t meet your Orthodox standards, that’s just outright bullying. And to what purpose? And although I could probably find another dozen examples of ultra-Orthodox small-mindedness, this takes the cake: When you say that Reform Jews aren’t Jews, well, why would I want to become part of your small-minded, bigoted, dishonest group called ultra-Orthodox Judaism? Sorry. Not feeling it, dudes. When you can move beyond your dishonesty and your pursuit of appearances above all, maybe I’ll consider you Jews. For now, I don’t. I consider you a pox on the People. You’re no different than the Jews whose senseless hate led to the destruction of the Second Temple. Oh, what’s that you say? I don’t have the authority to say you’re not Jews? Who says so? Oh, because “sefer sheli,” huh? Because it’s YOUR Torah? Sorry, guys. It’s my Torah too. And it’s the women’s Torah too. It’s everyone’s Torah. When you can get beyond your circular arguments, do feel free to get back to me. And when you do get back to me, you can explain how Ruth, the great-grandmother of King David, who joined the People simply by saying “Your people shall be my people, and your God will be my God” is Jewish, but I’m somehow not, even though I’d be right there in the gas chambers with you if the pogroms came again. Grow up, already. You’re an embarrassment to all of Judaism, and I doubt you even realize it. Today, I had to make a painful decision. I stopped following Pop Chassid, who I’ve followed pretty much since I started this journey, and Hevria, the Jewish artistic magazine he started sometime this past year, because apparently Elad Nehorai can’t be bothered to consider me Jewish unless I convert Orthodox (which will happen around the same time the sun freezes over). Oh, he tries. He says. He tries to understand that a person can be Jewish and yet not be Jewish all at the same time. He calls this a “paradox,” that non-Jews (by his estimation) can somehow have Jewish souls. He says he can’t call people like me non-Jewish anymore, but he can’t call us Jewish either. And that somehow he has to do both. So at the end of it he says he will both consider people like me non-Jewish and Jewish at the same time. Not good enough, Elad. Not good enough. I’ll just quote Jonathan Byrd: “Admit that your perspective might feel right and be wrong.” Because it is. It’s not a paradox. It’s a decision Elad has to make, and doesn’t want to, because no matter which way he goes he’s going to hurt someone’s feelings and/or offend someone. But regardless of his struggle, I’m still Jewish, and I’m still a Jew. Either accept that or don’t, Elad, but don’t twist yourself into a pretzel saying that I both am, and am not, Jewish. Either be honest that you’re accepting a bigoted, closedminded, narrowminded definition of Jewish (“Orthodox only”), or open your mind and accept that I’m a Jew too. You can call it a paradox, but what it is, is justifying a bigoted mindset. It’s the same thing as the people saying “heritage not hate” about the Confederate flag. That heritage is hate. It’s the same thing as why Christianity has fractured into thousands of different sects – because of this “you have to be exactly like us or you’re not part of us” mindset. Demanding that Jews must be Orthodox or else not be considered Jewish is no different. Now, I shouldn’t care what one Orthodox blogger thinks of my Yiddishkeit. And mostly, I don’t care, any more than I care what fundamentalist Christians think of my gayness or atheists think of my religiosity. But when someone says that who I am is not real, because it makes them uncomfortable? Because it creates a “paradox” for them? She’asani Israel, Elad, even if you don’t like it. She’asani Israel, even if you can’t handle it. I categorically reject his questioning of my Jewish authenticity. I categorically reject his defense of his decision not to consider me a Jew unless I’m Orthodox. And I categorically reject his blog, his magazine, and his attitude, until he shows some evolution in this mindset and realizes that it’s not a paradox but only an attempt to protect his prejudices. I have friends who are Orthodox who consider me Jewish. I have corresponded with an Orthodox person on Quora who told me that Orthodoxy isn’t for everyone, and he doesn’t consider me any less Jewish just because I’m Reform. If they can do it, Elad Nehorai can do it too. And until he does, I’m not reading his blog or his magazine any more, and I’m going to encourage others not to, either. My semester is pretty much done. I filed my grades on Thursday and Friday, and hopefully I can plan better for the next semester. This semester was insane – I overloaded myself with grading, and because I was sick early in the semester, I was running behind right up through the last week of classes. That wasn’t fair to me or to my students. I have resolved to do better in the coming semesters. Before our last Intro class on Wednesday, the husband and I also had to go to the make-up class on Yom Kippur, which we missed because we were both sick with the flu in the fourth week of the class. That was interesting as it was just 45 minutes in the rabbi’s office with two other people who were also taking the make-up. There was no Mr. C. We had a good class, and part of me feels that it was because he was not there. My husband made an observation that “Yom haKipurim” had “Purim” in it, which floored Rabbi. He said “You’ve gone about six levels deeper than I’d planned to!” Then he told us how the Kabbalists feel that “kipur” – the root of “kipurim” – can be read either as “kipur,” or “to afflict,” or it could be read as “ki” – “like, or similar to” and “purim” – the celebration of Purim. Some Kabbalists apparently feel that in the World to Come there will only be two holidays observed – Yom Kippur, and Purim. They are balances to one another; Yom Kippur is about repairing our over-indulgence, while Purim is about repairing our under-indulgence. My husband is going to be a Kabbalist. I can see this happening. Thankfully, Mr. C. won’t be in the later class for those who will be converting. Rabbi sent out an email saying that for those who are formally embracing Judaism, the new class will start in June. Since Mr. C. is only interested in “learning” (read here: telling us all about how HIS religion does what we’re talking about, even though none of us could care less), he isn’t part of that group. Rabbi also took Mr. C. aside during the break of the last class and informed him that it would not be appropriate for him to be part of the new class. Apparently Mr. C. got upset (his back was to me, and it was loud, so I couldn’t hear his reaction – but those who could hear confirmed he was upset) but oh well for him. I have so little sympathy for him at this point that it’s sad. Another class member said to me, “Now he’ll say that the Jews hate him, too.” (He’s already said the Episcopalians hate him. Gee. I WONDER WHY. Christians, if you want people to take you seriously, trying to hijack a class that’s about a different religion so you can talk about your religion is not the way to go about it. I know that 99% of you don’t do this, but the 1% that do make all of you look bad, just as the behavior of the haredim at the Kotel makes all Jews look bad to the rest of the world.) As an autistic man, I know I’m socially clueless, but this guy makes me look like a social virtuoso by comparison. I’ve friended almost all the other class members on Facebook, and most of them are going on to the formal class. I’ve sent in my final exam, so I should be getting a shiny certificate saying that I completed the class. Whee! One of the things that came up when we finally did get into the Shavuot lesson was how Shavuot was a move from just celebrating the harvest to celebrating the receipt of Torah, and the argument about how to measure the calendar days to it. The Sadducees (who were the urban, upper-class, priestly class, who rejected the Oral Torah) wanted to measure it in a way where it would not be the same date every year; the Pharisees (predecessors of the Rabbis, who were the regular Joes who argued for the Oral Torah, among other things – the liberal group) wanted it measured so it would always fall on the same date every year. The Pharisees won that argument. I find it somewhat amusing that so many Christians lack the context of rabbinic argument, so they read the Christian Bible and see its stories of the Pharisees and the Sadducees challenging Yeshua ben Yosef on points of Torah interpretation as “they’re trying to trip him up and make him look stupid!” when that isn’t the case at all. It was, frankly, description of a discussion between rabbis of different branches, and in many ways similar to what we see in the Talmud of descriptions of rabbis arguing fine points of Torah law and interpretation. There is some evidence that Yeshua was an Essene (another, smaller sect of Jews at the time of the Second Temple’s destruction). In that case, the “challenges” from the Pharisees and the Sadducees were simply rabbis arguing points of Torah interpretation. That sort of knocks the props out from under Christianity for me (again). One other thing that came up just in passing during that last class: the Mishnah is the Law, and the Talmud is the interpretations of that Law. Good to know! If the beit din asks me that in September, I won’t look like a fool when I answer them. In other news, the husband and I are planning to go to the Tikkun Leil Shavuot at our shul later this month. It’ll be interesting to see how it’s different from the one I went to last year at the Shul Down the Street. My husband has told me he’s not ready to go to the beit din and the mikveh yet, and he’s planning on spring for that. I’m fine with that; it’s totally his decision, of course. But the other day he said “We’re Jewish,” for the first time. Up until now he’s avoided saying it because he hasn’t been to the beit din or the mikveh, but I think something clicked for him that becoming Jewish isn’t something that just happens when you go into the mikveh. It happens along the way. I read an article a few months ago about the mikveh (I wish I could find it, but a Google search hasn’t helped me). I liked the idea behind it – it was a convert saying that going to the mikveh does not wash away his past. Rather, it adds a layer of Judaism to what’s already there. The mikveh as an additive process, rather than a subtractive one, is a powerful idea for me. So that’s what’s going on in Shocheradam land. How about you?